A new poll out Wednesday has bad news for Gov. Patrick. WASHINGTON (CNN) - A new poll suggests that that just three in 10 Massachusetts voters think Gov. 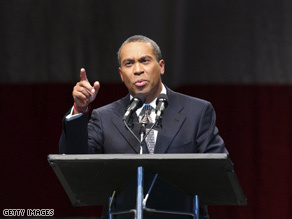 Deval Patrick deserves to be re-elected next year, but dissatisfaction with Patrick as governor does not translate into support for a Republican replacement in next year's general election. Twenty-nine percent of people questioned in a WHDH-TV/Suffolk University survey released Wednesday said Patrick should be re-elected to a second term in 2010, while 56 percent said it's time to elect someone else as Massachusetts governor. Fifteen percent are undecided. The poll's release came one day before Patrick announced that Paul Kirk would serve as a temporary replacement for the late Sen. Ted Kennedy. The survey indicated that Democrats are split over whether Patrick deserves to be re-elected. Three out of four Republicans and six out of 10 Independents say it's time to elect someone else. According to the poll, 42 percent approved of how Patrick's handling his duties as governor, and 49 percent said they disapprove of how he's doing his job. But a majority of those questioned, 54 percent, said Massachusetts would not be better off with a Republican as governor, while 35 percent disagreed. And the survey indicated that Patrick leads possible challengers in hypothetical election match ups. The WHDH-TV/Suffolk University poll was conducted September 12-15, with 500 registered voters questioned by telephone. The survey's sampling error is plus or minus 4.4 percentage points. Republicans nor Democrats are the answer. I see people come on this website day after day claiming to be thinking individuals. Has it ever occurred to you guys that both parties are scratching each others backs. After Clinton first came out of the White House, new outlets uncovered that Clinton was having breakfast every Sunday at the Bush mansion, and they call him 'son.' How about that change. America is so gullible. I think I'll run. "we WILL be dismissing your heroes REAL SOON." You mean like that behavior we had th epleasure seeing the aftermath of in Kentucky? Who you gonna string up Mr. Veteranman? Hmmmm, toughguy? You might want to call up one of YOUR favorite heroes and have him teach you a thing or two about subtlety....or is this what you're gunning for CNN (pun intended)...loudmouthed whackjobs making thinly veiled promises of violent action in response to the fact that their ideological cohorts have lost control of the country? Looking to incite hatred and violence much? It's absolutely hiliaroius to listen to GOPers and conservatives blabber about how evil it is that MA is a "one-party state." Ummmm...you checked in on places like SC or TX lately? MA is doing a mite better than those two, I can assure you. Idiots. "Wake up Massachusetts. Democrats and liberals are not the answer. They want to keep you down so you keep voting for them." Yeah yeah, and the GOP wants to keep everyone unedumacated and misinformed, so people will keep voting for them. Barack reads, Unions Thrive and the Economy dies. I am surprised any Democrat now gets even 30% support, are the voters in Massacheusetts that stupid? Americans vote based on their perception of the economy. If it is good, the incumbent person and/or party likely will win. If it is bad, the challenger/challenging party will likely win. Americans whine if inflation is 10%. Try inflation rates in the 10's of 1000's of percents for a real taste of hardship! Americans think the president actually controls the economy. The economy is cyclical, it goes up, it goes down. The mistake was electing him in the first place. That does speak volumes – that no matter how damaged the image of Obama and the democrats are, they still out-poll the GOP by something like 2 to 1. But keeping howling about the coming bloodbath, it only gives resolve to your opponents GOPers. Isn't it funny that the Republicans are in such an uproar about this and STILL can only get 35% support for a Republican replacement. How many ways can you say . . . .LOSERS!!! They'll just ask the Kennedy family to appoint a new Governor.